This cake is lovely in the afternoon, served warm with a cup of Earl Grey tea. It is dense, rich and buttery – and gluten free. It will last in the fridge for a week, and will still taste as good as the day you baked it. 1. Preheat oven to 165C fan-forced. 2. Combine almond meal, icing sugar, rice flour, white chocolate and vanilla bean in a large bowl. 3. In another bowl, lightly whisk the egg whites and add the melted butter. 4. Combine the ingredients of both bowls together, mixing well. 5. Line a 20-centimetre springform pan with baking paper and pour in the mix. 6. Lay the strawberries evenly over the cake. They should sink slightly into the mix. 7. Bake for 35-40 minutes, or until the cake is golden brown. TIP When checking whether the cake is cooked, don't rely entirely on the clean skewer method. The cake is very dense and so the skewer may never come out clean. Give the cake a firm touch and you will be able to tell if the centre is still wet below the crust. 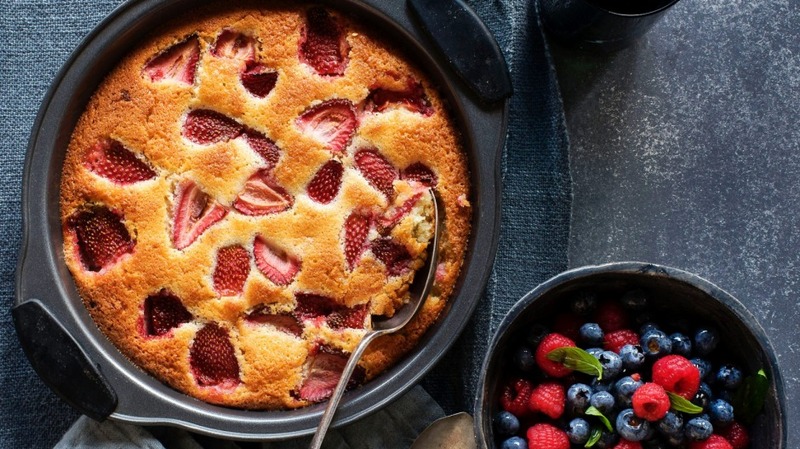 Serve with a bowl of macerated berries.